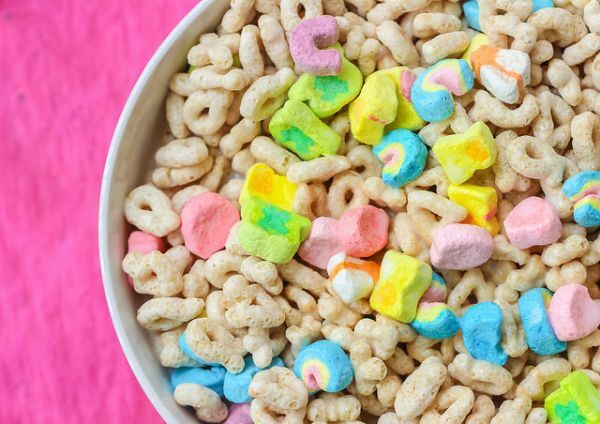 When I was a kid in the 1980s, I learned from my television that Lucky Charms contained seven essential nutrients and was part of a complete breakfast. At the end of the commercial it would show this complete breakfast: a modest bowl of sugary cereal in the middle of a spread of traditional foods, including a plate of toast with jam, a glass of orange juice, a glass of milk and a plate of fruit. I don’t think I ever had a “complete breakfast” as defined by General Mills, but that image is what appeared in my mind whenever somebody said, as everyone did, that breakfast was the most important meal of the day. I was never tempted to doubt that maxim, because I loved food so much that I couldn’t imagine somebody voluntarily going to school or work without eating something. When I did my liquid food experiment last year, the response taught me something that seems obvious in hindsight. I learned how stubbornly people will defend their beliefs about food even when they cannot tell you why they believe those things. I found that the more certainty people expressed about their food beliefs, the less able they were to provide evidence supporting those beliefs when asked. Claims of certainty make me skeptical. Where did the “three meals a day” axiom come from? It probably has more to do with what time daily mass was held in the Middle Ages than anything related to nutrition. But tell someone you’re not eating lunch today, and they might prepare an intervention. “If you can’t pronounce the ingredients, you shouldn’t be eating it!” is a more recent favorite. But it has some strange implications: well-read people can tolerate obscure ingredients that would harm others, and the illiterate shouldn’t be eating anything at all. I am gradually coming to the conclusion that most of our popular notions about eating are nothing more than unexamined folklore — all culture and no science, bolstered selectively by food marketers wherever it suits them. Certainly one effect of marketing is that it has successfully convinced us to eat too much. Unlike many other types of product, there is a natural ceiling on how much food can be sold. If there are 300 million Americans, who require 2,000 calories per day on average, then only 600 billion calories per day can be sold to them until the market ought to be saturated. This natural limit gave food marketers a particular problem they had to solve if they wished to grow: “How can we get people to eat more calories than they need?” We’ve seen how they’ve done it. Increasingly absurd portion sizes. Comically large soft drink containers. Grooming an expectation for meat at every meal, and displaying close-up images of high-fat, high-sugar foods almost everywhere we go. The most effective strategy is something we now take for granted. From the television era on, food has been marketed primarily as a source of gratification and reward. Food advertised for its nutritional value is a “niche” product. This artificial market growth translates directly to excess fat growth on the bodies of the population. Famously, about two-thirds of the US population is overweight. The habit of excessive consumption is held in place by what have become our normal expectations surrounding eating: what a plate of food should look like, how often you should eat, how enjoyable it should be, how you should feel after a meal, what you should do when you feel hungry, what “balanced” means, and so on. Now that I’ve decided to turn my back on conventional food axioms, it feels like a trove of options has been uncovered. Maybe I don’t have to eat three times a day, or eat the same amount of food every day. Maybe, on a given day, I don’t have to eat before noon, or after noon, or even at all. There may be good reasons to follow some of our conventions, but I’m not going to follow them unless I can find these good reasons. This may mean no more than making sure that you get all your eating done between noon and 8pm every day, and maintaining a fast for the other sixteen hours (for half of which you are asleep.) There are other forms too: two-day-a-week fasting, or alternate-day fasting. Note that the goal isn’t necessarily to eat less, but to do all your eating in a restricted timeframe. Of course, most of us do eat too much, and intermittent fasting (I.F.) might make it a simpler matter to consume fewer calories overall. The central idea is that the body operates differently in a fed state than it does in a fasted state. Normally we spend nearly our entire waking day in a fed state, eating from shortly after we wake. Advocates of I.F. claim there are health benefits to spending more time in a fasted state than just the normal 8 or 9 hours surrounding our nightly sleep. Intermittent fasting has been associated with extended lifespan, and resistance to age-related diseases such as cancer, arthritis, diabetes, heart disease, and neurodegenerative disorders. The science on I.F. is far from settled, however. Basically, the results of animal trials are extremely promising, but there isn’t much conclusive science on humans. The anecdotal evidence, for what it’s worth, is quite positive, even glowing. People claim they have experienced loss of excess bodyfat, lowered stress levels, improved cognition, reduced signs of aging and more. I’m not sold either way. There are doctors and scientists who advocate intermittent fasting, and they seem to have legitimate credentials. But I’m also aware there’s probably a lot of hidden entrepreneurship going on anywhere we see “breakthroughs” in the science of fat loss. While I’m agnostic on the health effects, I’m extremely curious about what it’s actually like to do it. So intermittent fasting will be my next experiment. 1) To see what it’s like to go without food sometimes. Food insecurity has been a real part of life for many or most of history’s human beings, yet I have missed maybe a dozen regular mealtimes in my entire life. Voluntary fasting obviously isn’t at all the same as genuine food insecurity, but it will give me a taste of what it’s like not to be able to eat whenever I want to, or am used to. I suspect it will make me a bit better at refraining from indulgence in general, and a bit more grateful. 2) To see if it makes for a simpler way to reduce my caloric intake. I mentioned that reducing the amount one eats isn’t necessarily a part of fasting, but I do believe I consume more than I need to, and restricting my feeding times might make it simpler not to eat too much overall. 3) To discover people’s reactions. For me this might be the most interesting part of the prospect of fasting. I’ve discovered that whenever you change your eating patterns from the norm, many people around you suddenly become health experts, certain that you are ruining your life by the minute, and perhaps diagnosing you with anorexia nervosa on the spot. Their sermon usually begins with, “Don’t you know that’s terrible for you! ?” followed by a lesson in some popular bro-science. I find this hilarious, and quite revealing of the baselessness of our cultural beliefs about food. 4) To see what else I learn about my habits, my body, and my relationship with food. Quite often the greatest benefits of my experiments are unforeseen; just getting myself to behave differently for a while reveals better ways to do certain things, even if they have nothing to do with my original intentions for the experiment. First of all, I want to be clear that I’m not recommending anybody else do this. While I don’t believe for a moment that human beings fall to pieces when they deviate from normal eating patterns (just ask your Ramadan-observant friends), the science on I.F. is inconclusive. There are also people who definitely should not be fasting. From what fasting advocates say, I’m an ideal candidate for it: young male with no health problems and a flexible schedule. Consume calories only between 12 noon and 8pm, every day. Work out at the end of your fasting period. This is actually not a huge adjustment for me, as I seldom eat much in the mornings, and I normally work out at 11:30 am. But having hard edges on my eating period will make it easier to stick to my caloric goals. I am tracking my weight and caloric intake daily, and calculating my body fat percentage weekly. At the end I’ll report everything. I’m aiming for about 2200 calories per day on average, which represents a slight deficit for me for my size and activity level. I expect and intend to lose a bit of weight. I run three times a week and do moderate strength training two or three times a week, and I walk everywhere, but my line of work (writing) is just about perfectly inactive. An ongoing log can be seen here. Because I delayed this post by a week in order to announce Making Things Clear, I’m already a week into the experiment. So far it’s been interesting. I’ve been using the 5:2 diet for over a year (no more than 600 calories each day for 2 days per week). I’ve lost weight (up to 20 lbs lost, but slipped back to 15 lbs) and feel rather better. 1) Vegetable juice and coffee for breakfast and the balance of calories as an evening meal work well for me. 2) Unless I’m mindful, I eat extra snacks on non-fast days to ‘make up the deficit’, particularly at times like Christmas or Weddings. My mind, or maybe my body, or both, clearly thinks fast days are deprivation rather than freedom. 3) As a (well controlled) diabetic I find carbohydrates are the most seductive and damaging ‘hungers’. I’m undergoing a relaunch of my diet vigilance, although it’s not really ‘a diet’ but a different way of living. I considered doing two weeks of 16:8 and then two weeks of 5:2 but it seemed like neither period was long enough to learn much. I may try it one day. Thanks for this post, it really made me think about the strength of conviction displayed by some people about anything, especially when it is not clearly evidenced based. We have to look at this from an evolutionary perspective. Many many years ago, when we didn’t have clinical trials and academic journals in which to publish their results, we had folklore culture. Time honoured traditions, beliefs in the form of story, song and practices like herbal medicine. These beliefs could not be written in books as being useful and effective practices and passed on to future generation, so a song, story or belief is sung or told with great conviction so that it remains in the minds of the next generation and so on. Ever heard of the expression, my grandmother swears by …..? That’s a modern example. We cannot easily lose a technique used for millennia by most humans to ensure their own validated experiences were passed on. Yes some advanced cultures like Egyptians and Minoans may have recorded their convictions, but most bog standard bog men had only their memories, so they had to be very sure the person who passed on that belief was very sure too. Belief has become a really interesting topic to me recently. I think our stubbornness stems from how we identify with our beliefs. A self-described conservative, for example, is going to have a much harder time considering a new liberal idea presented to them than a new conservative idea, regardless of the logic or evidence provided for either one. When it comes to food people seem particularly defensive, and I think it’s because our food beliefs are wrapped up in our cultural and familial identities. Throw in the reinforcement of marketing and it becomes really controversial to doubt the status quo. I agree with this. The only restriction I have out of principle is animal meat, aside from that I eat everything if I feel like I really want it, and I eat when my body tells me to. Allowing myself to just gravitate towards what I want and staying mindful of what that is indicates when I am too stressed out in my life. When I start craving high carbs or high fat/salt foods, I know something is wrong emotionally and I tackle the cause, not the symptom. You’re using some loaded terms here: “dogma” and “bandwagon hopping.” If you read the post you should be able to see that I’m not sold on the idea of intermittent fasting, I just want to see what it’s like. But you do present another common maxim: “Listen to our bodies.” I think generally, we do. If I eat something and it makes me throw up, I don’t eat that any more. But I don’t think “listen to the body” is specific enough an instruction to base all of your eating decisions on it. Your body is not articulate enough to explain that you need a particular micronutrient, for example, or even that you need micronutrients at all. As well, some might argue that our bodies tell us to overeat when possible, having evolved in conditions where famine is a risk. Heh… clearly our ideas of the right way to eat are all over the place. I can’t imagine the “not eating at all” people are serious. Can you tell me the name of this documentary? I’m afraid they are serious. I understand they find it difficult to prove that they actually don’t eat anything. What a surprise. Ah, yes the breatharians… I’m definitely more than skeptical of zero-calorie approaches to nutrition. Just like psychic ability, if this was possible it would be very easy to prove, but nobody has so far. “One man just drinks coffee” that’s what he says. Doesn’t make it true.”It’s more in the head” indeed something seems to be going on in their heads. The documentary series I saw were on YouTube. You can find them if you type in ….’old man did not eat and drink for 70 years’ or ‘ documentary about Buddha boy Ram Bahadur Bamjan. Congrats and good luck on your fast experiment. I think you have sound points for the trial, and am curious about what will the results be. * When you first fast (after a significant period of time or the first time in life), you will tend to feel more desire to eat (at the time of eating), which may push you to overeating, and subsequently to an unhealthy way of fasting. Many Muslims unfortunately suffer from this in the month of Ramadan mostly because they have unhealthy eating habits outside of that month. Therefore, it is not surprising that they can’t adapt because they are not mentally nor physically ready for this beforehand. Lesson? Be cautious about the temptations resulting from previously adapted eating habits. Of course, I.F. is different than Islamic fasting but similarities are there anyway. * Here is another controversial point: as each individual is unique in terms of a lot of things like fingerprints, we are also different and presumably unique in ways we react to different foods and diets. So, as I mentioned, observe the reactions of your own body, and change things along the way to find your own balance. * It goes without saying that whatever diet you follow, just make sure you stay away from things whose package cannot be eaten. Basically, what that means is that an orange is also packed but the package itself is edible, while a chocolate’s package cannot be eaten. One of my old co-workers used to kid around (a kind of joking which implies a truth in it): “Why don’t you eat the package together with the chocolate (or whatever is in the package)? Don’t you know they share the same health benefits?” So, yeah… You already know it. As a side point, I can’t tell if you will be a bit better at refraining from indulgence in general (though I think you would) but I can tell you almost for sure that it will make you feel a bit more grateful. After a long period of hunger, even the casual piece of food like a simple soup feels like you’re having a king’s meal so to speak. All the best, and good luck again. P.S.2. I learned some other exotic ways of fasting which few of my friends followed. I’m planning to switch to that if everything goes smooth till the end of Ramadan. Then, hopefully, I’ll be ready to share more results on a different experiment. Thanks Burak, I appreciate these points. I’m excited to hear your findings. I’m already noticing the effect on gratitude. When it does come time to eat I notice I am a lot more conscious, and I have an impulse to eat more slowly. My normal dinner portion sizes now strike me as ridiculously large, and I want something more reasonable. Coming from a family with a high poverty mentality, food has always been really important to us. My parents were both from the untouchable caste in India, resulting in very little money for food (or anything else). Once, they had money, it was as if the floodgates opened. They are both healthy, but they love their food and they instilled that love in us. Even with the history above, I agree that most people eat too much food. There are days where I will have only 2 meals, and be quite happy with it. Especially since, I gave up gluten, my appetite is suppressed considerably, causing me to need less food in general, as I don’t have the sugar highs and lows as much. I wish you good luck with your fasting experiment – fasting is a really common way Indian people show their appreciation for the Gods, so its a part of my life, but I am interested to see what a different context for fasting results in. Thank you for the well-wishes. I didn’t really mention it, but I am interested in the spiritual history of fasting as well. I’m not an ascetic, but I am really interested in observing desire in meditation, and fasting certain provides opportunities for that. In India, we fast for days at a time, for certain occasions. And almost every Hindu has one day out of the week that is assigned to their God that they fast for. Thus, fasting is just a part of life. It is the way we show our devotion to the Gods. Skipping a few meals can really teach you a lot about your own mind and how it plays tricks on you. Try it out and let me know if you want to chat further about it. Good luck, David. I am wondering whether you still partially substitute classical meals with soylent (or its DIY alternative) or not. I remember you were quite enthusiastic about it some time ago. How did it continue? I am thinking about giving it a try. There must be a reason why s. is not mention in this post of yours. Thanks. Yes I still do. I no longer make a distinction between my DIY and the other food I eat. It’s been almost a year now… I’ve forgotten it’s not normal. At the moment I consume about 50/50 DIY and solid food. From what I have read/seen the IF reduces some blood numbers and lose you about 1kg per month. The basic is that the body needs 5-6 hours to get into burning fat. If you eat something in this time…. But the moin point I think is that you learn to hear what your body says and the difference between hunger, appetite and need. That is a main interest for me in this experiment, yes. I suspect my “hunger” is really just a psychological expectation of food at particular times per day, and I want to uncouple the psychological need for food from the physical one as much as I can. Oh, the last thing I wanted to say was that I wonder if all of these fasting/paleo/whatever other fad is popular now work just because you’re more mindful of what you’re putting into your body. There are people who eat a big mac every day but still get lean because they stay within their caloric range! Yes, I think that increased awareness may be responsible for most of the improvements associated with different ways of eating, and it is actually the most interesting part for me. Getting away from norms also means getting away from automated habits, which means more conscious decisionmaking about food, and probably better choices. Serendipitous timing. About two months ago, I stopped eating immediately upon waking. This had nothing to do with trying I.F. It was just an attempt to challenge some of my assumptions about how I was “supposed” to eat. I always believed I couldn’t wait because I’d be too hungry, and I also believed that science supported the idea that breakfast at waking was critical for eating properly. Mostly I was just accepting dogmatically what had been conveyed as conventional wisdom all my life. But even though I was eating a fairly healthy diet, I was/am still struggling to get to the weight I want. Now, I take my first meal between 11am-1pm most days, and I’m finding it much, much easier to achieve a healthy calorie deficit. More importantly, I’ve discovered I won’t go insane from hunger pangs by waiting a little while. In general, I’m eating just as much of the stuff I enjoy but less in aggregate. I don’t know for sure how much this pattern has contributed to the weight and fat loss I’ve had in the last two months, and I don’t really care. The scale’s going in the right direction, I feel good, and this pattern feels like something I can maintain comfortably. That last bit is so critical. It doesn’t matter if there is a silver bullet diet if you can’t get yourself to abide by it. You touched on something that’s been on my mind but that I did not mention: sometimes we eat at certain times because we are afraid of the feeling of being hungry. I always thought hunger pangs HAD to be met with food, or else you’re wrecking yourself or developing an eating disorder. I now really doubt that. Finding something you can stick to is also crucial, as you say. There’s no point in making changes that are always a struggle. That’s part of the reason I’m trying this on, to see if it’s something I could settle into, if I found it beneficial. If you read the original book by Michael Moseley he points out that the main reason the diet is effective because it battles the psychological side of dieting rather than just the physiological, and one of those reasons as you say is learning to not fear hunger. The other main reason is making the delay of gratification easier – rather than depriving yourself with no end in sight, you just have to wait until the following day (and then the urge has usually passed). If you haven’t read it I’d recommend it as it is very evidence led – completely refreshing for a diet/nutrition book. The guy’s been an actual proper doctor all his life and it shows in his writing. I’m a huge fan of your blog so am really excited to hear you’re doing this – am looking forward to seeing how you get on! I watched Michael Mosely’s documentary before beginning the experiment. I don’t recall it from the film, but I really appreciate the notion that a fasting protocol teaches you about your psychological needs related to food, even if your physiological needs are being fulfilled to the same degree. Learning not to fear hunger is already becoming a really empowering skill. I look very much foreward to hearing your experiences with this, David! I have tried fasting myself, as well as many other food regimens. Not to loose weight, but to see and feel the effects. I tried vegetarian, vegan, omnivore, paleo, but most interestingly, ketogenic for two extented periods. The most troublesome aspect has definitely always been the social one – other people can be quite fierce about this! The social pressure is confounding. People are incredibly offended at food experimentation for some reason. That’s really interesting to me. I wonder why people get so offended when someone else is doing an experiment with food. Do you think it might be that there are millions of people starving in this world, and then there’s us in the Western world who are deliberately restricting or changing our food intakes, when we probably could eat without restrictions (financially)? I just find this stuff fascinating. I, too, look forward to hearing more about your experiment! I’m currently doing a slow carb experiment of my own, and I am, more than anything, fascinated to notice the triggers that often used to get me eating when I wasn’t really hungry. Just the awareness, and not acting on it, is key for me! Who knew? Probably something many Americans should try- so often we think we NEED to eat, when pausing to check in with the stomach and any feelings we have around food would help us to determine whether or not it’s really a need… Thanks for your post! One thing I love about these experiments is that it exposes the triggers in my behavior. When I stop doing things in my normal way, the feelings surrounding it become much more conscious, and I discover a lot of the hidden/forgotten causes behind my lifestyle choices. Even if I don’t stay with this, I will have learned a lot. The cognitive effect of diet is interesting. I don’t doubt different habits have different effects on mental clarity. All the more reason to experiment. Regarding being afraid of hunger, I always thought I should eat as soon as I felt any symptom I interpreted as signaling hunger. I believed that I would get shaky and weak from not eating because it happened a few times. Then I heard a quote by Dr. Joel Fuhrman, whose Nutritarian diet I now follow. He said, “Being hungry isn’t an emergency.” Seems simply obvious but I realized that I had been making my hunger an emergency. Now if I get hungry and it’s inconvenient to eat or I just don’t want to eat yet, it’s really no big deal. I’m really interested to see what you find out with your experiment because I’ve been curious about IF. Yes, this was a big revelation for me too. If you think about it, relatively few human beings have had the luxury of being able to eat food any time they feel like it, so it can’t conceivably be something the human body requires. Eager to hear about the results of your experiments. I imagine someone has commented on this before, but . . . As a father of two, the primary concern for me about the liquid diet and the experiments you are thinking about is that the structure of traditional sit-down meals seems so valuable for the family and there are so many ways the culture is actually breaking down places of connection for the family. Most of the people I talk to don’t sit down together as families anymore and there are many losses to them as a result. I know you aren’t trying to “push” this onto families or anything, I’m just saying the social contact, process, and structure of having meals together is important too. Thanks for all your thoughtful posts over the years. That is a common and valid concern. We do eat for social purposes as well as nutritional purposes. Generally soylent users eat a normal sit-down dinner (and a liquid breakfast and lunch). I do this too even though I live alone. I would never give up having normal meals with other people. You might want to look at “The Story of the Human Body: Evolution, Health and Disease” by Daniel Lieberman – it’s a fascinating look at how the human body has evolved over millions of years, why we eat the way we do, and why we all have such trouble with fat. On the “to investigate” list. Thanks Cecilia. Habit is a powerful thing. Tie it to beliefs and they can be virtually immovable. That certainly applies to food. Food is laden with meaning (psychological, religious, cultural, biological, ethical, political, emotional, intellectual…did I miss any?) and peeling the meaning away can feel almost impossible. I read a ton on nutrition and am always happy to read someone’s take on food. There’s only one book that I feel leaves all others behind in terms of extensive research and keeping bias in check as much as that is even possible: Good Calories, Bad Calories by Gary Taubes. He’s the investigative journalist who debunked the idea of Cold Fusion back in 1993. He decided to turn his attention toward nutrition based on repeated requests for him to do so. His book is incredibly well researched and anyone who wants to decide whether or not to read it can see a summary of 10 key findings on page 454. Incidentally, I’ve ended up practicing intermittent fasting as a result of mostly eating food that doesn’t sport a nutrition label. My body just doesn’t want/need “three squares a day” so I just eat when I’m wanting a meal or when I have a social engagement that calls for a sit down meal and/or beverage. Sometimes that means not having anything for the better part of the day. And, when I’m travelling, I find I rarely eat in transit. 8-12 hours can go by without the slightest hunger pang and it makes jet lag easier to deal with for some reason. The best part is having been able to leave many food obsessions behind and just go with what feels right in the moment. Having fewer hang ups has definitely been a relief. I look forward to hearing how the IF is going for you. Wondering though how you’ll be calculating BF% (impedance, calipers, bodpod). No “at home” options are even close to accurate. If I take nothing else away from this, I will have learned how to miss a meal when there is a good reason to do so. This skill would be especially helpful when traveling. I can’t count the number of times I’ve eaten crappy food from a gas station or airport kiosk just because I thought it was wrong to miss a meal. For BF% I am using an online calculator where you input about a dozen measurements. I don’t expect it to give me an accurate number, but it will let me know what direction things are moving. I’m glad the way I eat finally has a name. Now I can be in on a fad, instead of a weirdo who never eats breakfast or lunch. I think you’ll find that you end up eating fewer calories overall and losing weight. I’ve been chided by coworkers, telling me my body is going to burn muscle if I continue to skip meals, regardless of calorie intake, yet nobody has provided me with sound scientific evidence. The only other thing I do, aside form IF, is limit sugar intake (no candy, cake, doughnuts, ice cream, etc. for me). I indulge from time to time, but to keep my weight in check, I keep sugar out. Good on you for demanding evidence. People are nuts. Your comment reminded me of a weird conundrum I’m having. I started this fast shortly after a new boutique donut place opened in my city. People are raving about it, and they have sold out of donuts every single day they’ve been open. They sell out by 10 or 11am, so it is not possible for me to try them until either this experiment is over, or the novelty dies down and they become less popular. This has led to me fetishizing these donuts, and a trip to the donut place is definitely the first thing I’m going to do on Day 31. And I don’t even normally like donuts. This fast is teaching me how psychological my food needs are. Last year I experienced for the first time in my life living on the edge of my nutrition. What I mean by that is I felt for the first time like my body was a machine, telling me exactly when it needed food and immediately showing me the consequences of either getting or not getting it. My wife and I were biking 50-60 miles a day on our way from Vancouver, Canada to the Mexican border and during that I’m I had never felt more in tune with my body’s nutritional needs. Time for another bike ride maybe? I’ve been doing IF for around 2 years now and I think it’s the greatest thing ever. And yes, my friends think I am weird. I lost around 12 pounds doing it and I was only doing a 6:1 instead of a 5:2 (I’m 34 and in great shape so I didn’t want to push it). Personally I feel a strange “high” on the day that I am fasting. Did you find there was an adjustment period between when you started and when you felt good during your fasts? I have been doing IF for 2 years twice a week 16 hour fasts, Its the first time in my life I haven’t had to watch my weight. I’m paleo and do exercise, IF has made me more aware of what I eat when I’m hungry and when I’m not, and food has become less of a focus more fuel than obsession. I am finding myself much more aware of how much I’m eating, and why. If nothing else, it’s shaking me out of my mostly automatic eating habits. I am also more productive, I think because I no longer have the excuse to eat something when I get to a hard part in my work. I have been doing a sort of ‘soft’ version of IF for a couple of years now and although I am still not sure if this is the best way of eating for me, I haven’t come up with anything better so far. My eating window is usually 11 hours during the week (reason: work) and 9-10 hours during weekends, with energy dense food being eateng within 7 – 7.30 hours (I eat fruits for the first meal). The biggest revelation for me was that it is possible to have relatively stable energy throughout the day without any ups and downs correlating with meal times. I usually had some sort of energy crash before lunch in the past, when I was eating normal, carb loaded breakfasts. If I ate more fat or protein it would be even worse, because my body would be completely exhausted by this intense morning digestion on top of having sugar crash. What follows, I also have a sense of giving my digestive tract enough time to rest during the evening, night and early morning. Then I start slowly and eat the biggest meal at the end of the day. Wish you good luck with experimenting! I’ve eaten this way for over ten years. It suits me fine. I sip from a liter of Sencha loose leaf tea in the morning. My workout is two hours after waking. The effects of the fasted state with the green tea then the workout are additive. An almost perfect euphoria carries me into midday. First meal is around 1 pm. I eat from my own personal “food groups”: animals, plants and fats. I eat a relatively large percentage of daily calories from fat and a low percentage from carbohydrate. My second meal is around 6 or 7 pm. My fasting blood sugar is always around 74. Hunger doesn’t exist. My energy is fine other than the times I become convinced I’m Spiderman and push the workout a bit too far. The two benefits that turned out to be most profound for me, the two I’m aware of every day, were a surprise. My breathing and my thinking are both different and better. If there is “a way” the human creature is supposed to eat, I think I am closer to it than I used to be. Reading this blog for the first time and your experiment is exciting. Tried the I.F myself and although, it is can be daunting but there is more energy that is if you can go through the headaches. I’m over two weeks in now, and the fatigue is gone. I feel great. But I sure didn’t for the first ten days. Hi David, do you allow yourself non caloric beverages during the fasting hours, or is it water only? I am not clear if the metabolic processes that occur during fasting are influenced or interrupted by the ingestion of caffeine, for one example. Or non caloric sweeteners, that many people says that influence the brain neurochemistry similarly to carbohydrates. I have read recently, I think in the NYT, a lengthy post about the anti aging benefits of a 12:12 fasting, which seems much easier to adopt. Do you think the added difficulty of the 16:8 schedule pays off? Hi Marcos. Yes, non-caloric beverages don’t interrupt the fast. I drink a lot of coffee and some tea. I do think the 16:8 pays off over 12:12, at least in terms of the benefits I’m experiencing. 12:12 is pretty close to what people do anyway (we all fast when we sleep, and usually don’t eat anything a few hours before bed. The biggest benefit for me is that it makes it simpler to reduce overall caloric intake. Thanks for this Hamlet. I may try alternate-day fasting sometime. I read this a couple of years ago. It’s written by Dr. Michael Eades who is one of the best-known bariatric doctors in the US. Being an Indian, fasting is very much part of our daily lives. But its more of a spiritual practice than a scientific one. In fact most of the people observing fasts go through them as a religious ritual rather than spiritual reasons. Do share the results. I am sure they will be good. Good luck to you. be careful be don’t eat hidden dangers food?? do u know about Hidden dangers food??? click here now for knowledge and more detail.. The hidden dangers in foods today are vast. One of the most underestimated dangers is sugar. Now most of us know that sugar in excess is bad, but they fail to realize the extent of the dangers. since searching for a connected subject, your website emerged, it seems to be like big. I bookmarked information technology in my google favorites. contributed this incredible website along with us so I concerned take a peek. bookmarking and you will be tweeting this at my own followers! Big blog as well as outstanding style and design. I love everything you men are up also. These types of smart jobs and insurance coverage! I like your process of experimentation, as I am a big believer that self-exploration is a necessary part of personal development. I’ve been an IFer for a few years now and it’s really helped me become a more intuitive eater. I really KNOW when I’m hungry vs. bored now. I still track calories and macros because I have some very specific goals, but I listen to my body re: timing or when I need a big refeed during a cut. It’s really liberating, but it takes time. It won’t happen in 30 days.